“Romeo speaks Spanish.” Emily Haines is grinning, gesturing at the caramel-brown ball of fluff tucked beside her. Romeo, her new puppy, is fast asleep, napping as the Metric frontwoman runs her fingers gently through his fur. Her knuckles practically stretch the entire length of his miniature body. “He knows ‘manos,’ like he’ll put out his paw,” she assures me. Haines and Romeo are nestled on a couch in the cavernous main room of the west end Toronto studio she operates with the other members of Metric. Behind her towers a massive console that looks like a 1940s telephone switchboard; she explains that the complex-looking device is where her bandmate Jimmy Shaw makes the synth magic happen. Metric is, after all, a high-octane affair—a sleek, well-oiled machine, hammering out gritty dance-rock anthems in strobe-lit arenas. The studio is adorned with the technological trappings of this glimmering operation. Amidst all of it sits Haines, a half-empty cup of coffee on the table in front of her. It’s almost reverently quiet, save for her voice breaking the silence. This is the essence of her new solo record, Choir of the Mind. It’s a profound, quiet, contemplative affair, rarely consisting of more than Haines’ voice and her piano. It’s a welcome, necessary reprieve from the inescapable clatter around us. The album feels like you’re seated on the floor of her bedroom, listening to her play new material; it sounds unpolished and pure, like the most essential version of her yet. When she was writing Choir of the Mind, she started delegating instrumentation to herself, singing what would normally be played by a synth or drum kit. It’s a surprising admission, given Haines’ extensive career as a performer and frontwoman. But she explains: “The relationship I’ve had with the piano is pretty much my primal relationship.” In the other room of the studio sits a piano on which she wrote much of her new album. And working solo is familiar territory for Haines. She began her career under her own name before forming groups like Metric and beloved Toronto collective Broken Social Scene. Even after those bands were gaining traction, she broke off to release a solo EP, and a full-length titled Knives Don’t Have Your Back. The record dealt with the death of her father, poet Paul Haines. She didn’t think the songs would fit with Metric, but she knew they had to be released—so she did it herself. Choir of the Mind is similarly urgent, and it’s threaded with the same intangible desperation that’s stretched over two decades of work: a desire to share, and, maybe, to save. 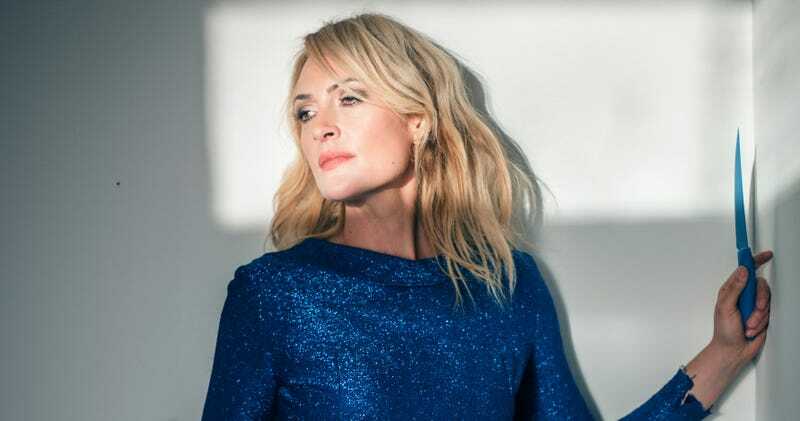 Haines’ new record is far removed from the arena thump and anthemic glory of Metric’s output, but the same heart and utility resound in both: she wants to make music people can use. “With Metric, we’ve always had a really strong contingent of athletes who are big fans, and to me that makes complete sense. That’s exactly [Metric’s] function, is to take sensitive, emotional stuff, really energize it, make it loud, and make it shake you and wake you up. This, I think, is the same intensity, but a completely different direction of just removing yourself from all the chatter.” On lead single “Fatal Gift,” she repeats, like an inescapable mantra, “All the things you own, they own you.” It’s cliché, but Haines’ earnestness gives the simple sentiment life. She is nothing if not earnest. Haines beams and punctuates with a shout. “Pow!” she laughs, tossing the paper down and sinking back onto the couch. Even as she eviscerates herself, she grins.